C is for Citrus! Here is a great citrus recipe from my cookbook Easy Gluten-Free Entertaining, using seasonal pink grapefruit! 1. Cut grapefruits in half around the equator of each fruit. 2. Heat grill or grill pan to very hot. 3. Mix together the maple syrup, tamari and sesame oil. 4. 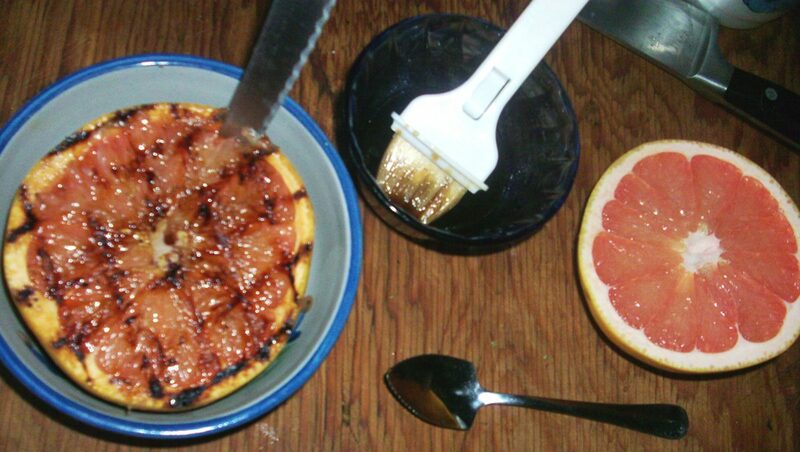 Brush the Maple Tamari Glaze across the surface of the grapefruit. 5. Place cut side down on the grill for 1 minute. If cross-hatched grill marks are desired lift the grapefruit and turn 45 degrees, placing it down on a different portion of the grill. Remove after 30 seconds. 6. Using a grapefruit spoon or a small serrated blade, cut the grapefruit sections away from the rind. 7. Brush the top with additional Maple Tamari Glaze and serve. Delicious as a brunch or lunch starter! This entry was posted in Food Allergies and Sensitivities, Gluten-Free, Love Your Veggies!, Peak of the Season and tagged Grapefruit, grilled fruit, grilled grapefruit, maple, maple tamari grapefruit, tamari on April 2, 2014 by Chef Christy.